Sorry... the 2017 Lexus NX 200t is no longer being sold as new. 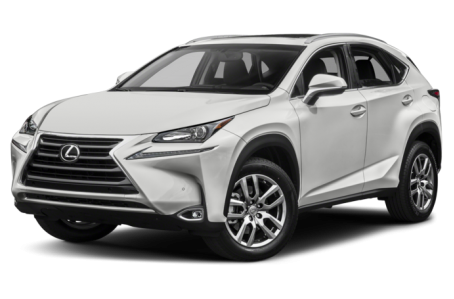 The 2017 Lexus NX 200t (NX Turbo) is an entry-level, mid-size luxury SUV that seats 5 passengers. It competes with the BMW X3, Mercedes-Benz GLC-Class, and Acura RDX. The available NX 300h hybrid variant will be covered in a separate overview. This year, the NX remains largely unchanged. The NX has unconventional styling that is bound to turn heads. It follows the same “L-finesse” design language as the rest of the Lexus lineup. The front-end features the signature “spindle grille” and jagged headlights. The NX is also accentuated by deeply grooved, angular channeling throughout the exterior. Standard features include power/heated side mirrors, a rear spoiler, a dual-pipe exhaust system, and 17-inch alloy wheels. Available features include a trailer hitch receiver, LED daytime running lamps, automatic dimming side mirrors, a power liftgate, and new 18-inch wheels. The F Sport version also offers a unique mesh grille, a more aggressive front fascia, adaptive LED fog lights, sport-tuned suspension, front and rear dampers, two-tone 18-inch wheels, and special badging. Powering the NX is a standard 235-hp, turbocharged 2.0-liter 4-cylinder engine mated to a 6-speed automatic transmission and front- (FWD) or all-wheel drive (AWD). Fuel efficiency for the NX 200t is an EPA-estimated 22/28 mpg city/highway (22/27 mpg for the F Sport AWD). Inside, the NX comes with a premium leatherette interior with a 60/40 split-folding rear seat. This year, the Remote mobile app has been added to the available Lexus Enform Service. With the mobile app, the driver can remotely start the engine, unlock/lock doors, and find the vehicle in a crowded parking lot. The Lexus Enform Service also includes emergency communication, vehicle status and maintenance information, navigation assist, and search for places of interest. The center stack features a standard audio system that includes a touchscreen, CD/MP3 playback, Bluetooth connectivity for phone and audio, and a USB port. It can be upgraded with an integrated navigation system and a 10-speaker premium audio system. Standard features include automatic air conditioning, power front seats, and remote keyless entry. Available features include a power moonroof, a power tilt/telescoping steering wheel, leather upholstery, heated front seats, ventilated front seats, a memory seat, and a wireless smartphone charging station. The F Sport version comes with its own unique interior treatment, paddle shifters, NuLuxe-trim seats, and active sound control. The NX was named a Top Safety Pick Plus by the Insurance Institute for Highway Safety (IIHS). It also earned a full 5-star safety rating for the National Highway Traffic Safety Administration (NHTSA). Standard safety features include a backup camera and a tire pressure monitoring system. Available features include a blindspot warning system, rear cross-traffic alert, a lane departure warning system, a pre-collision system, and adaptive cruise control. 39 of 40 (97%) consumers said they would recommend this vehicle to a friend.